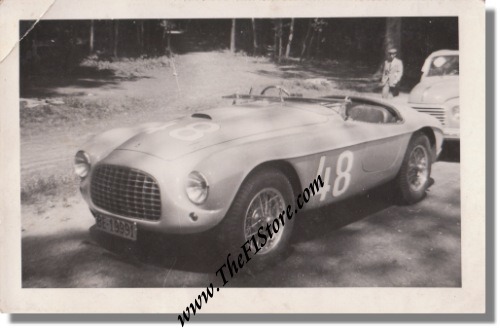 Vintage 1952 Photo, Ferrari 212 Export Touring Barchetta S/N 0134E, Preis von Bremgarten. This is a vintage 1952 photo of the 212 Export of Hans-Karl von Tscharner during practise for the GP of Bremgarten on May 17, 1952. The next day, von Tscharner would win his class in the race itself. It was the car's maiden race. The photo measures some 5.5 x 3.5 inches or 14 x 9 cm and has a fold in the left top corner.